Daughter #2 has been hinting the past few weeks that she’d really like a new lunch bag. Her old one, which I made 6 or 7 years ago, had become beaten up, with the edges peeling off. I looked back through my files for the original tutorial from 2007, found some oilcloth in my stash, and made this one. Cute as can be but . . .
. . . something made me look up oilcloth, and I learned that it contains phthalates (scary, scary stuff) and is now considered not food safe–yikes. This information was not available when I made the first one–sigh. So after doing more research, I decided to make yet another lunch bag, this time from laminated cotton, which is PVC free, BPA free, lead free, and Consumer Product Safety Improvement Act (CPSIA) compliant. 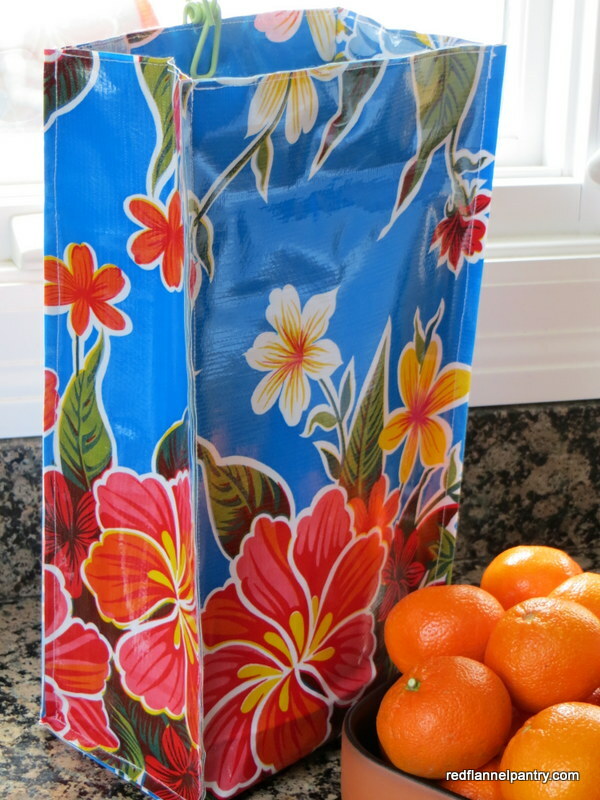 You can read how oilcloth and laminated cotton compare here. 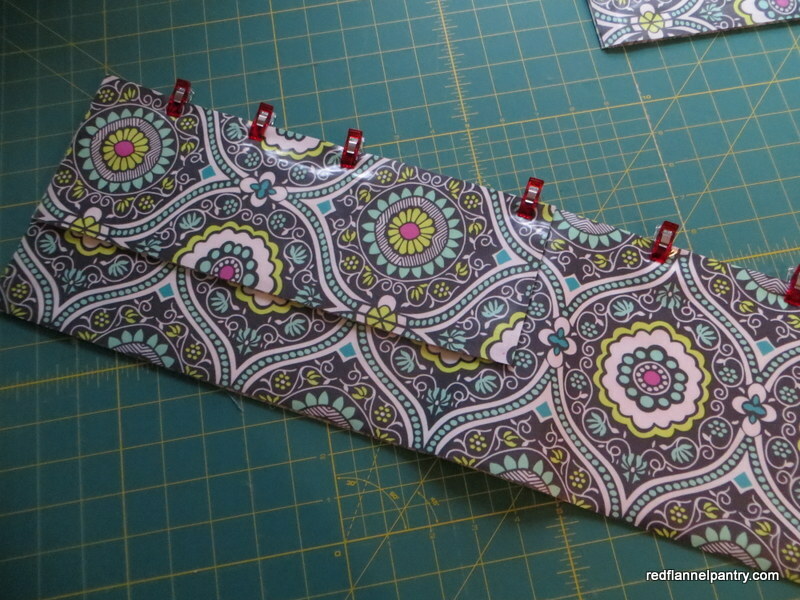 Since the edges of laminated cotton, like those of oilcloth, do not fray, I opted to use the same lunch bag pattern. There are lots of clever designs for lunch bags out there. I showed several to D#2, but she insisted on the same exact one (but no Velcro please!). I found some pretty Amy Butler laminated cotton at the fabric store. Laminated cotton has a soft drape compared to oilcloth. I put Insul-Brite batting between the layers to provide insulation and add some structure to the bag. Clover Wonder clips, which weren’t around when I made her first lunch bag back in 2007, hold layers together tightly without creating holes like pins would. When making both bags, I found that after I sewed the first side panel to the main panel, I was left with exactly 1 inch extra at the top. (Is the pattern for the main panel off an inch or are my sewing abilities at fault?–a mystery.) I carefully cut it off using a ruler and rotary cutter and then sewed the other side panel in place, which fit just fine. 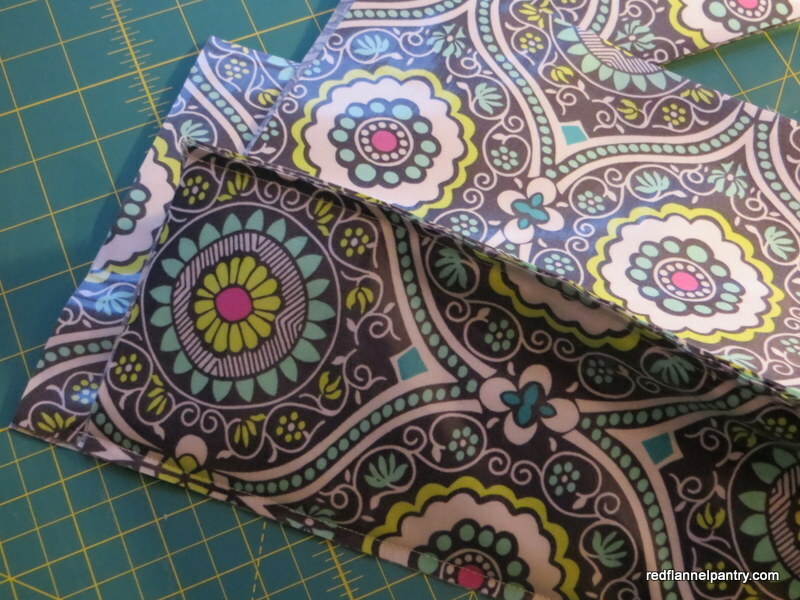 There’s a helpful post at Pink Chalk Studio about sewing with laminated cotton, and Debbie at A Quilter’s Table has a post about oilcloth pillows and then offers a bunch of links related to laminated cotton and oilcloth sewing tips and projects. I used a regular walking foot and regular needle to make both bags, although I should have probably used a denim needle when sewing the oilcloth. I also used a slightly longer stitch length. If I were to sew with this stuff regularly, I would consider investing in a Teflon foot. When sewing, I found the laminated cotton less “sticky” than the oilcloth. 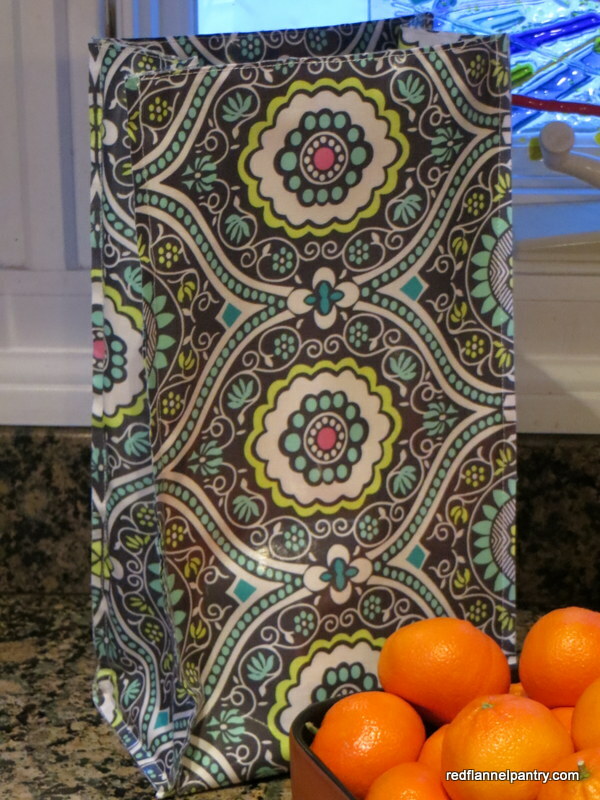 Now, what should I do with the rest of my oilcloth? I like this bunting idea and this one. I enjoyed sewing with the laminated cotton–I could see using it for chair cushions, a double-sided picnic blanket, or tote bags. I have several pieces of laminated fabric, too, and never cut into them–saving them for a “special” project. Your lunch bag is a terrific idea–and thanks for the tip about the Insulbrite to help give it some body. Adventures into the great unsewn.